This coming week on the Cosmic Treadmill, Reggie and I are discussing the final issue of the first volume of Doom Patrol wherein the team goes boom. Along the way we touched a little bit on the various incarnations of the team... and among those include the book we'll be covering here today... the 2004 John Byrne Doom Patrol re-boot/launch/imagining... whatever. I remember hating this when I first read it 12 (!!!) years ago. Likely due to my Morrisonian-bias. I'd like to think that, during the interim, I've perhaps found a way to check it out and review it on its own merits. Let's see if I can't hold it together! We open on the roaring visage of Grunt... a four-armed ape (or is that gorilla?). He's suddenly been triggered by something deep within a nearby prison. With him is Nudge, Vortex, and Faith from the JLA. A strange whirling cloud formation appears above the penitentiary and a huge... chunk of machinery blasts from the building right in their direction. Faith is able to deflect the machinery, which is sent straight up in the air. Before it can descend, Vortex uses his "silent scream" to destroy it. With the threat averted, the crew looks into the gigantic hole left in the building. We shift scenes to the JLA watchtower where Batman and Martian Manhunter are discussing recent events. They battled a group of vampires called the Tenth Circle and met a new team of heroes called the Doom Patrol (who their teammate, Faith, left with). Batman can't shake the thought that this case may not be as closed as they think and asks J'onn to use his martian telepathy. Back with the kids as they explore the abandoned former Confederate jail. Nudge mentions that Niles Caulder bought the place a decade prior and used it to contain his most dangerous prisoners. The gang comes across three newly-opened cells. Before they can collect their thoughts on the situation, Elasti-Girl, Rita Farr crashes through the wall. We hop back in time seventeen minutes where we join Rita, Cliff and Larry... who is wearing a gimp suit instead of his normal bandages... as they find the Chief hung up in a crucifixion-style pose with a trio of rather uninspired-looking vampires surrounding him. Off to the side they see a punk kid reclining by the computer bay. Lucky for us, he decides to tell the Doomies his full origin. Ya see, Crucifer... the big bad of the Tenth Circle drafted him into his ranks due to his ability to open wormholes... oh, and his name is Wormhole too, by the way. He would travel through the portals to find folks for Crucifer to feast upon. Sounds like... not too terrible an idea, if I'm being honest. He continues recounting the ending of the JLA story this series spun out of where the League (which, for some reason I can't recall appears to include two Flashes) and the Doom Patrol take down the Circle. After the battle, Wormhole decided he'd release the three dangerous criminals being kept at the Caulder's Confederate Prison. Well, the Doomies have heard alls they can stand, and so Larry releases the Negative Man entity (which is a skeleton... nope, don't like that!) which immediately gets blasted to smithereens. This Vamp is, in reality, Barrage. Cliff's Vampy opponent is really Megalith... another baddie I've never heard of. Cliff is able to take him down handily... until the third Vamp reveals herself to be Rubber Maid... who despite this being her first appearance, alludes to the fact that there's some history between her and Cliff. The battle continues... the Negative Man entity "gets better" and Elasti-Girl helps Robotman untangle from his rubber-skinned attacker. Barrage turns his attention toward her and blasts her through the wall... taking us back to the "present". Yeah, this one didn't quite get better with age... still really disliked it. First, I hate the idea of launching a new number one issue where you needed to read the six-part story of another series to understand what's going on. I haven't read The Tenth Circle... probably since it's been released. Didn't much like that either. Now, I can't outright say that Byrne got anything wrong here. Where the characters are concerned, Cliff, Larry and Rita all act the way I would expect them to... and their dialogue seems right. Not too hot on gimp-suit Larry, but whattayagonnado? I think my main disconnect with this book comes from how much i dug what came before. I'm guessing that's not a terribly unpopular opinion... the way this leaves the "baggage" of not only the Kupperberg, Morrison, Pollack and Arcudi runs at the door... but the Drake and Premiani original as well... really left me cold. I think many a comics enthusiast projected a sort of braggadocious-ness to Byrne's revamp...launch...boot, whatever... which makes it hard to judge fairly. Like a feeling of "nobody else got it right" that I found it hard to shake. The new characters feel kind of one-note, though in fairness... they get precious little screen time here. They aren't visibly interesting... never did see any novelty in apes... which might make me a bad comics fan, but who knows? The art... it's not bad until we approach the end. The last few pages see the quality of visuals degrade a bit. I remember the first time I read this I thought the art was not up to John Byrne's normal standards... but, I was probably thinking of the series overall. For the most part, this looks good. Like I said, the ending... kinda sketchy, no pun intended. I do dig the coloring all throughout, though! Is this something you should read? Probably not. If you're a Doom Patrol fanatic, you've probably already read this... however, if you are and have somehow missed it... eh, put a hash-mark in the "win" column and call it good. 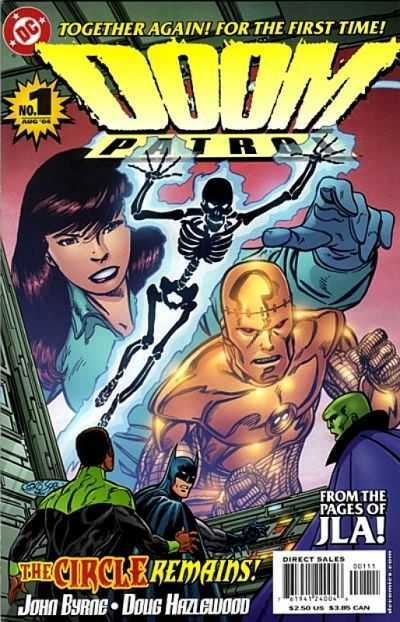 Yep, gimp-suit Larry really doesn't make me think "classic" Doom Patrol. Almost seems like something Byrne would rake Morrison over the coals for!